Created by the Creve Coeur Women’s Club in 1945. In the early years the library was moved in a nomad fashion between members homes until enough money was raised to build a small building. The library was opened in its present location in 1951. It became tax supported in 1955 and an addition was added to the building in 1961. A second addition was added in 1975 increasing the building size to 4000 square feet. In 1992 the library was converted from a Municipal Library to a Library District. 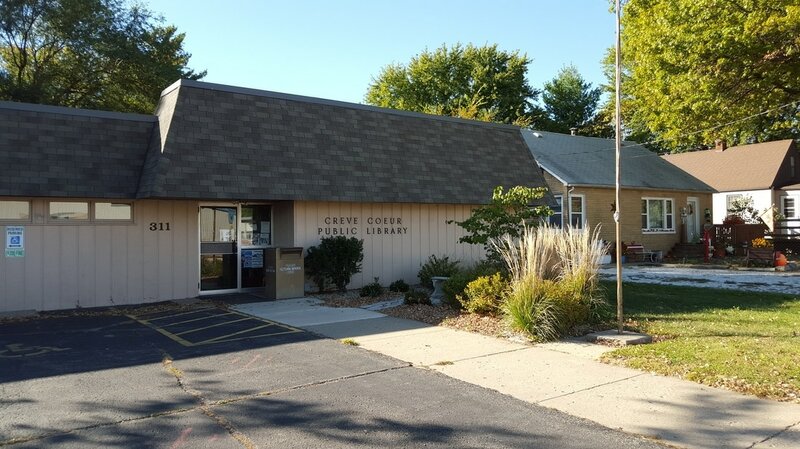 The mission of the Creve Coeur Public Library District is to provide educational, informational, cultural, and recreational resources and services to all ages of people in the Creve Coeur Public Library District. The library will provide access to the universe of information, and especially that information which is of immediate relevance and interest to the community it serves. The library seeks to accomplish its mission through prudent management and development of its resources, and by providing access to materials and services to meet the present and future needs of the community it serves. In this effort, the Creve Coeur Public Library District cooperates with other libraries, and with other educational, and governmental institutions. Special emphasis is placed on current popular materials. The library serves as a learning center and educational center for all residents of the community.